View Photos sent to your MailBug! Would you like to be able to view photos sent to your MailBug email account? Or, if you have a loved one who uses a MailBug, would you like to be able to send them photos along with your email messages? Now there is an easy way to do that by linking your MailBug to a digital picture frame – provided you also have access to wi-fi internet service. Emails sent with photo attachments add a whole new and personal dimension to any message, and helps maintain closer contact with friends and loved ones. While MailBug itself cannot display photos, by adding a digital picture frame and linking it to your MailBug account, you can now easily and automatically view photo attachments emailed to your MailBug account. With the advent of wifi/cloud-connected digital picture frame, this is now possible and does not require a computer. Once the picture frame is set up, photos sent as email attachments to your MailBug can be automatically displayed on the picture frame. Of course you can optionally select which email senders can send you photos that will get displayed. 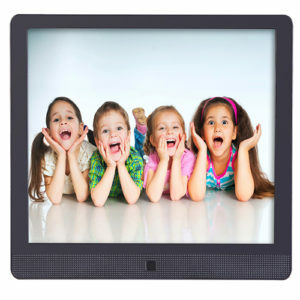 Digital picture frames can store tens of thousands of photos, and are available with a variety of slide show options. Via the use of a free web portal, the photos can be managed remotely from any internet connected computer. Pictures can be either received via email sent to your MailBug, or uploaded directly to the picture frame via the online web portal by a trusted friend or family member that you (or the MailBug user) allow to have that access. Using the digital photo frame will require access to a wifi network and an electrical outlet. However, that is common in many homes today. Your MailBug email service has many flexible options that let you determine how your email can be filtered, and selecting who can send you photos is easily done. Our Customer Support team can show you how, or we can set it up for you. If you are interested in a digital picture frame to display photos sent to your MailBug, then please contact us for more details, models, and pricing. Order your digital picture frame through Landel, and we’ll configure it for you and set it up to link to your MailBug email.